Nigel Short and Jan Gustafsson during a photo shoot at the start of the Songkran Festival. | Photo: Bangkok Chess Club. GM Jan Gustafsson (Germany) edged out GM Deep Sengupta (India) on tiebreak to win the Bangkok Chess Club Open. It was the second victory in Thailand for the 39-year-old German grandmaster. Both Gustafsson and Sengupta finished on an undefeated 7.5/9 and shared 170,000 Baht, earning U.S. $2,676 (€2365) each. Gustafsson had also won the tournament in 2011. Although he spends more time as a chess commentator these days than on playing, he keeps on returning to Thailand each year. "In my opinion, by far the best tournament in the world -- venue, playing conditions, everything," Gustafsson said at the closing ceremony. Gustafsson with the winner's trophy. | Photo: Bangkok Chess Club. Starting with five out of five, "Gusti" was the sole leader at that point. Tournaments are rarely won without a tad of luck, and that was also the case here as the German GM was given a nice present in that fifth round after a not very successful opening. The playing hall. | Photo: Bangkok Chess Club. After a solid draw with Indian GM Lalith Babu, Gustafsson's next opponent was former world championship contender and FIDE vice president Nigel Short—another regular guest at the Bangkok Open. Short had started his tournament with a very pretty combination. Can you find it? However, as early as round two Short dropped half a point. He blew a winning position and then escaped with a draw against FM Poompong Wiwatanadate, rated 2025, who was still working as an arbiter at the Bangkok Chess Club Open in 2016. Wiwatanadate vs Short. | Photo: Bangkok Chess Club. The English grandmaster recovered well with four straight wins, the first being against a 13-year-old Filipino rising star named Alekhine (!) Nouri. Short said that he had played 13 world champions in his career but that he wasn't sure if a win against Alekhine meant that he had played a 14th! Short vs the reincarnation of Alekhine. | Photo: Bangkok Chess Club. Before the game between Gustafsson and Short, in round seven, the two players did a photo shoot as part of the Songkran Festival celebrations (see top image). Held each year April 13-15, it was originally a new year celebration but is now mostly a spiritual celebration for washing away bad moves and bad luck. Short vs Gustafsson: short but sweet. | Photo: Bangkok Chess Club. Gustafsson crushed Vietnamese IM Duong The Anh the next day, after which a quick draw in the final round turned out to be just enough for tournament victory. Gustafsson shakes hands with Duong before the game. | Photo: Bangkok Chess Club. Short's Waterloo came in round eight. He had sacrificed pieces throughout the tournament, but this time it looked more like panic, and Deep Sengupta had no trouble converting the extra material. The Indian GM eventually came second in the tournament having a slightly worse tiebreak than Gustafsson. Deep Sengupta tied for first with Short as his biggest scalp. | Photo: Bangkok Chess Club. 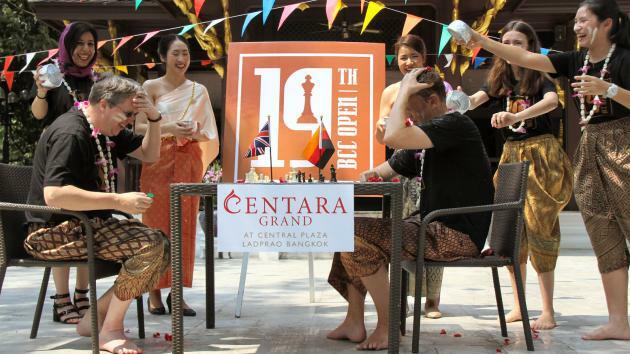 The Bangkok Chess Club Open was held for the 19th time. It took place April 6-14 in the Centara Grand ballroom of the Centara Grand Hotel in Central Plaza, Ladprao, Bangkok.